We haven’t read the haftarah assigned to Ha’azinu in four years, because Ha’azinu was read between Rosh Hashanah and Yom Kippur, so the haftarah for Shabbat Shuvah was read instead. This year, Ha’azinu is read after Yom Kippur, so we get to read II Samuel 22:1-51. This also contains a long poem, found (more-or less) in Psalm 18 and also read on the 7th day of Pesach. This is a psalm of thanksgiving and praise by David, addressed to the Lord “after the Lord had saved him from the hands of all his enemies and from the hands of Saul” (22:1), but I don’t recall the specific incident offhand, so you should look it up. Actually, this might go over better read in English by a good actor, with its dramatic and vivid imagery. I found chanting it in Hebrew to be a chore because (1) it’s long, (2) the language is difficult, and (3) it’s musically boring. http://thesukkahproject.com/thetubularsukkah.aspx worked out OK, so we plan to put that up again on Sunday, but this time using a level. 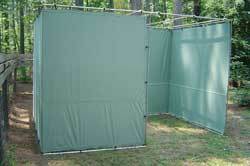 For high-concept New York sukkot, see http://www.jewishhumorcentral.com/2010/09/new-york-mayor-bloomberg-announces.html . And yes, there are Torah readings, the same for the first and second days, also read on the second day of Pesach (so my son got a decent amount of mileage out of his Bar Mitzvah reading, first day Sukkot, 13(!!) years ago): Lev. 22:26 – 23:44 (holidays) and Numbers 29:12-16 (sacrifices). 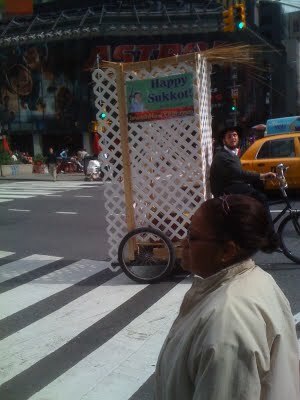 There are different haftarot, though, Zechariah 14:1-21 on day 1 and I Kings 8:2-21 second day, which each refer to Sukkot. An innovative teenage yeshiva student in Brooklyn, whose father directs a Chabad social services organization, has been pedaling a rickshaw carrying a portable sukkah around the streets of Manhattan and Brooklyn this week. Levi Duchman, 16, makes the rounds, inviting Jewish men, women, and children to make the blessing over the citron (etrog), palm branch, myrtle branches, and willow twigs that are held together (the lulav) and shaken as part of the observance of the Sukkot holiday, and eat a snack inside the structure. Well I’m blessin’ this thing it looks like a tree. It’s my lulav, It’s all shook up. Right before Succos people go and meet. Buy a lulav and esrog right off a the street. Kids seem to think it’s a real big treat. When their lulav, gets all shook up. Well the aravos (willow) look nice and hadasim (myrtle) fine. The esrog smells like a lemon or a lime. I go to Shul put my lulav in hand . My friends say they’ve got the finest in the land. Chorus: Well keep the leaves cool or they will rot. Pitom* off the esrog and kosher it’s not. It’s your lulav it’s all shook up. Well some shake to the right and then to the left. In the middle of Hallel is when it’s done best. No matter how you shake it when Hoshana Rabbas here. *The little point on the bottom of the etrog. If you break it off, the etrog is no longer fit fo rthe ritual. Question: What is the highest honor among Cowboy poets? Answer: Poet lariat. Question: Why didn’t the angry farmer divorce his wife when she traded their prize milking cow for a book of poetry? Answer: Because he vowed to love her for butter or verse. Question: What is a metaphor? Answer: For grazin’ yer cattle. Question: How does a poet sneeze? Answer: Haiku!!! Question: Why are poets always so poor? Answer: Because rhyme doesn’t pay. Question: Why did the traffic cop give the poet a ticket? Answer: For driving without a poetic license. Question: What do you get when you combine Robert Frost and James Bond? Answer: The Road Not Shaken but Stirred. Question: What’s big and gray and writes poetry? Answer: T.S. Elephant. Question: What’s a Grecian Urn? Answer: About twenty thousand drachmas a year after taxes. Question: Why was John Keats always hounded by creditors? Answer: Because he Ode so much. It awaits our judicial review. Not bad as doggerel, but I think Judge Goldberg should stick to his day job.